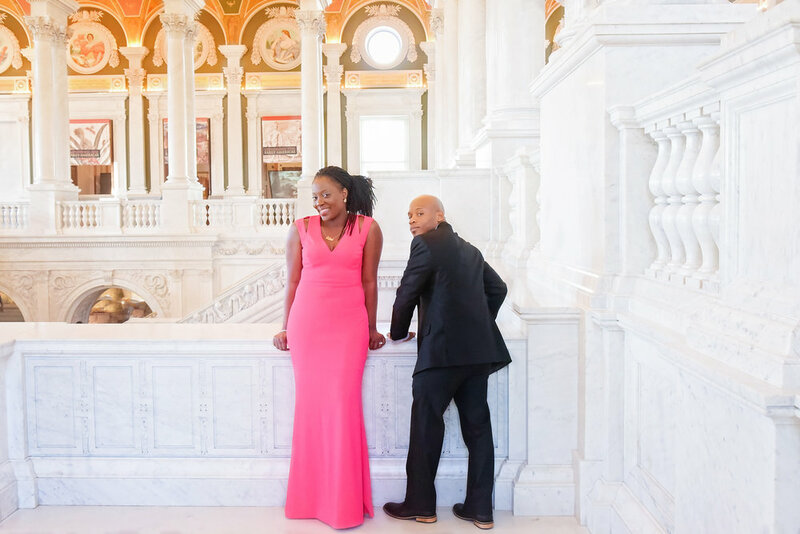 When Selena and her fiancé, Joharri emailed me to shoot their Engagement Session at the United States Library of Congress, I was over the moon! It is the oldest federal cultural institution in the United States. With grand architectural design and beautiful murals, it made for the most perfect backdrop for Selena's + Joharri's Engagement Session. Joharri and I met on November 15, 2015 at First Baptist Church of Glenarden. When I walked in, an usher sat me next to Joharri. I didn't pay him any attention throughout the entire service! When the service was over, he turned to me and said "you have such a beautiful voice. Are you a member here?" I said "no" and he replied "I should consider joining one of the choirs here". I looked at him shrugged my shoulders and said ok. It was late, I said goodnight and went home. A few weeks passed and we didn't see each other - although we were going to the same church at the same time. He says I was in his spirit and didn't understand why so he prayed one Saturday that if it was meant for him to pursue me, to please allow for him to see me again. The very next day he saw me on the video screen and said to his friend that's her! His friend told him to go say hello. He was so nervous that he just waved hello. A few weeks passed and we saw each other during New Years Revival service. I went out to use the ladies room and on my way back to my seat, I saw Joharri. He approached me saying "I don't know if you remember me or not, but I wanted to ask you out when I last saw you but I was really nervous". Then preceded to ask for me telephone number and I actually gave him my real number! He called me that Saturday and there hasn't been one day that we haven't spoken to one another!! Joharri told me that he was having a mini fellowship at his house and wanted to invite me. His very next sentence was "so what are you going to cook"? My thought was I'm a guest! On February 11, 2017 (the night of the fellowship) everything seemed to be going wrong! I washed my hair and it wouldn't dry after hours. I ironed my clothes and while rushing I burnt a hole in my pants!! I quickly made a pasta salad and was on my way to his house. When I arrived, there was 2 couples that we get together with as often as possible. We sat down only to find out that dinner was spaghetti with a side of pasta salad!! As they began to go around the table and share what they loved about their spouse and us, I quickly learned that this was a "pre Valentines Day" dinner. As everyone is talking, they are crying and I was looking around as if I missed something. As they went around the table, I was next. I told everyone what they meant to me and how they are more like family to me. I turned to Joharri and told him that he was my best friend. We've had so many ups and a few downs but I wouldn't have chose to do it with anyone else. He turned and said he wasn't expecting that and he needed some water. He got up to get a bottle of water and returned with a Love Lily (my favorite flower is a lily). I was in awe over the flower. He went around the table and spoke to everyone and saved me for last. He turned to me and said "Selena I love you... you are an amazing person. See the thing is I don't want to be like the disciples who were afraid to get out of the boat to see what Jesus had for them. Will you get out of the boat and walk into the unknown with me?" He proceeded to get out of chair and walked around. He got down on one knee and said "will you be my best friend and my wife, will you marry me?" I starred at him in amazement, disbelief, excitement. I said yes but he didn't hear me as he waited down on one knee. He says it felt like 10 minutes that he was on his knee - but that wasn't true. I guess you could blame how loud the music was but he finally heard me after I said yes the third time!! We are set be married on July 28, 2018 in Bethesda, MD. A little Note from Lacey O.
I'm so happy that we have met and grateful to share your wonderful love story with everyone. You two are truly a wonderful couple together! I can't wait to shoot your FABULOUS wedding in July! It is going to be amazing!